Welcome to Eastern Slopes, my name is George & I will show you around my home! Purrrr…. 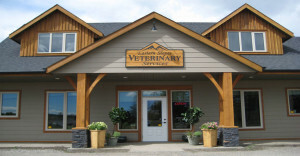 On July 20, 2009, Eastern Slopes Veterinary Services moved into a new facility just a few minutes away from the original hospital. Expanding an additional 1000 sq. ft., with the staff lounge and offices on the second level and the main hospital on the ground floor. 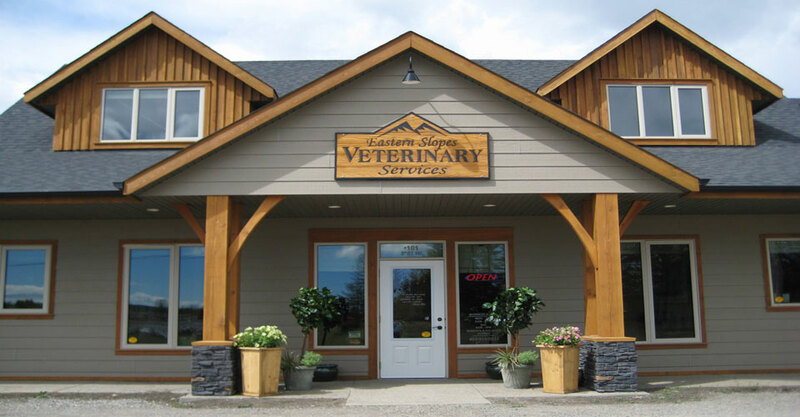 Since opening its doors in 2003, we’ve grown from a one vet, one tech, operation to host 2 Veterinarians, 3 part-time Receptionists, 2 Animal Health Technologists, 1 Animal Health Technologist Assistant not to mention our regular volunteers and intern A.H.T. students and a new larger facility! We are located up on the hill, 3rd Street N.E. (the road to Rona), along the highway heading east to Okotoks. This spot was chosen for being centralized to accommodate clients and patients from Millarville/Priddis, Turner Valley/Black Diamond/Longview, Okotoks/High River area and even as far as Bragg Creek/Dewinton and Calgary. Since our opening Dec 2003, more than 10,000 animals, including dogs, cats, birds, small pocket pets, and the occasional alpaca have passed through the doors of Eastern Slopes. Dr. Rozema also does some out calls for client and patient convenience. 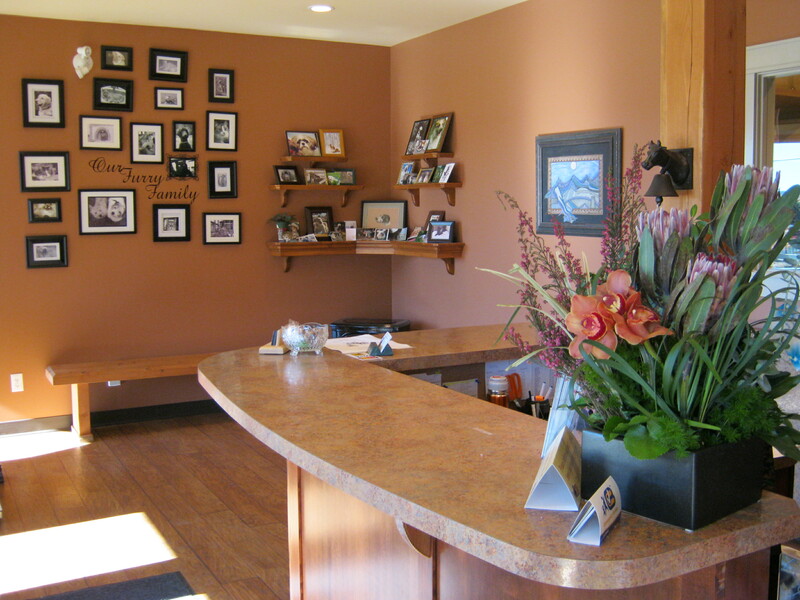 Greeting you in the lobby of Eastern Slopes will be one of our friendly and knowledgeable receptionists who are available to make appointments and answer general questions from opening to closing. Of course as the resident clinic cats, Frosty and George will be there for petting. The lobby is bright and airy with a relaxed, at-home feel, making the visit as stress-free as possible. When you walk in the door, we want you to feel right at home. Relax in front of the fireplace and enjoy fresh coffee or Tea throughout the day or come in and sit back and chat for a bit. There is also fresh water and treats available for your companion pet. Our waiting room is decorated with relaxation and comfort in mind. This large room is filled with photographs of patients, local art work and large sitting benches for clients going into appointments. We always try to keep your wait time to a minimum. However, on occasion, emergencies or very sick pets may cause a delay in the schedule. If you have to wait, make yourself comfortable with a drink and a magazine. Our public washroom is off the reception area of the hospital and it is wheel chair accessible. It is also large enough to fit the stroller for the moms and dads who bring the little ones. Our reception area displays a variety of pet products for your convenience. 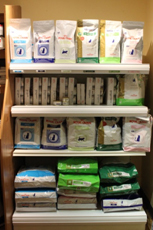 We carry a number of healthy animal treats and home dental care, ear cleaner and once-a-month flea and intestinal parasite protection, along with grooming aids, collars, leashes, and more. Whether it is pill form, a liquid or ointment, we stock a range of prescription medications to allow you to start your pet’s medication immediately. Each weekday, our inventory management software generates a report advising us which medications require re-ordering. An order is placed with our supplier each weekday, resulting in delivery the following business day. Eastern Slopes Vet Services has two examination rooms. These rooms are designed with seating for clients to sit if they wish and are large enough for multiple family members to be present. The two cozy examination rooms are equipped with a standard array of medical instruments including an otoscope to examine your pet’s ears, also an ophthalmoscope to examine the eyes, and a view box for x-rays and of course plenty of treats to reward the good behaviour of our furry friends. It is in the examination room where we take the time to get to know you and your pet; review your questions and concerns about your pet’s health and perform a thorough physical examination. Exam room 2 has a private entrance for when it is time to say goodbye. This provides you and your family with privacy, respect and compassion at this difficult time. This work station allows the veterinarians and technologists to sit, type records, and make telephone calls to clients, with the library in the above cabinets, all while having a full view of the observation kennels and treatment area. The treatment area is where high risk cases are monitored, pets are prepared for surgery, recovered afterwards, have blood drawn for diagnostic tests, and are administered I.V. fluids and more. We also use this area to treat critical care patients and emergencies that need easy access to fluid therapy or critical care nursing. Needless to say, this is a busy and important area of the clinic. Before our veterinarians perform surgery on your pet, they must prepare themselves in a sterile manner. A special sink allows the surgeon to scrub their hands and arms without touching a faucet. After carefully and thoroughly scrubbing, the surgeon needs to dress in a cap, mask, sterile gown and gloves. 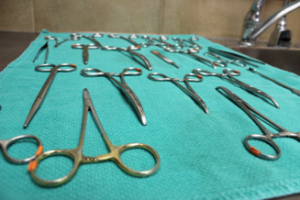 Hand towels, gowns and surgical instruments are steam sterilized in our autoclave. All this occurs in a separate area away from the busyness of the rest of the clinic. The surgery suite of Eastern Slopes is accessed through swinging doors from the surgical prep area. 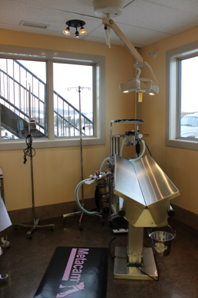 The suite is equipped with an operating table, anesthetic machine and a modern surgical lamp. All instruments and supplies used in a surgical procedure are kept in wall cabinets within the suite, minimizing traffic in and out of each room during the procedure. Our laboratory plays a vital role in maintaining the health and well being of your pet. Our technologists routinely perform a wide variety of blood and urine profiles with specific attention to the diseases that effect animals. Common tests performed include are full CBC’s, blood chemistry profiles, clinical cytology, urinalysis, and also tests to detect Intestinal Parasites and Parvovirus. We also have a sliding glass window to pass histology samples through from the surgery suite. As the saying goes, “Pets Need Dental Care Too”. The dentistry area features up-to-date equipment with almost everything you would find in a human dentist office including high speed dental drills, dental radiographs and ultrasonic scaler. Our services include full dental charting, scaling and polishing If warranted, any necessary extractions can be performed. All these procedures are done safely under anesthesia with I.V. fluids and constant monitoring. Inflamed gums are similar to an open, infected sore. As your pet chews its food, the inflamed gums bleed, thereby allowing bacteria easy access into the bloodstream. The bacteria which are carried through the bloodstream can cause liver infection, kidney infection/failure, heart valve infection and arthritis. Our clinic has complete diagnostic imaging services. The radiology area contains a radiograph machine, and X-ray view boxes with a separate processing room. Radiographs are an excellent means of assessing bone structure as well as soft tissue. Eastern Slopes utilizes digital equipment that delivers instant images. Ultrasound allows us to look inside the body without actually looking inside the body. State of the art digital ultrasound helps our veterinarians make accurate and timely diagnoses, and follow the progress of diseases under treatment. We can also make copies of your pets’ ultrasound to have as documentation should the need arise to seek emergency or referral care. You are able to remain with your pet in our dedicated ultrasound area, while the ultrasound is preformed. The odds are, at some point in your pet’s life, he/she will require hospitalization and treatment for an injury or medical condition. For this reason there are three kennel areas, the first being the special care area where patients requiring continual supervision, but not in need of intensive care, are monitored. This is in full view of the veterinarians and support staff. Our dog runs area spacious, clean and secure. They are located through a door off the treatment room and are convenient to a outdoor potty area. Medium and large dogs stay in our dog runs. On the opposite wall are kennels reserved for small to medium sized dogs. Blankets and comforters provide comfort and warmth. All dogs are taken outside on a double leash for a short walk during their stay. Any patient thought to have a contagious illness is placed in our isolation room. Our Isolation Ward is located off the back entrance and is also equipped to have its own monitoring, cleaning and ventilation system to avoid cross contamination and for animals that need protection against certain environmental elements. 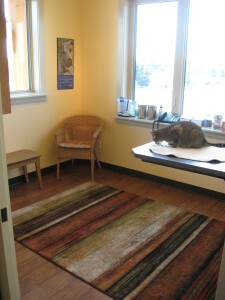 Fortunately, because most of your pets are well vaccinated, we rarely have patients with contagious diseases, so this room is not used very often. Thanks for taking the tour of Eastern Slopes Veterinary Services. Come on down and we will give you a personal tour!